Mike and Stephanie watch as the plane departs Petrof Glacier Beach, Alaska. 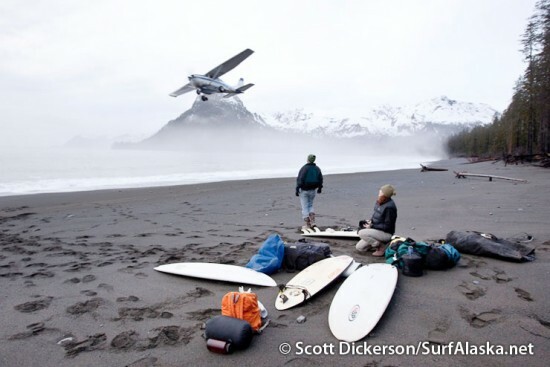 In 2009 our dreams of surfing this particular remote break in Alaska were realized, several times actually. All told I think there was about seven attempts at getting there and maybe four successes. 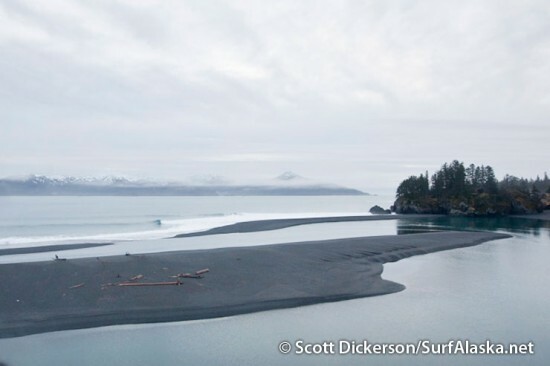 The spot is called Petrof Glacier because the beach we surf is nearby the glacier and it’s the easiest way to locate it on a map. 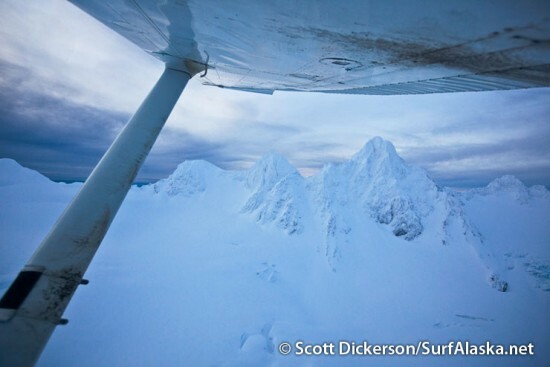 Access is by a short bush plane ride through the Kenai Mountains that is really long on scenery. In the brief 15 minutes of flying we cross Kachemak Bay, pass several glaciers, countless mountain peaks, an ice field, more glaciers, glacier lakes, rivers, and then back to the ocean in the Gulf of Alaska and the much anticipated moment of . . will it be fogged in? . . . will there be a swell? Flying through the Kenai Mountains in the morning. Flying over the beach to make sure it's suitable for landing. The break is dead center. 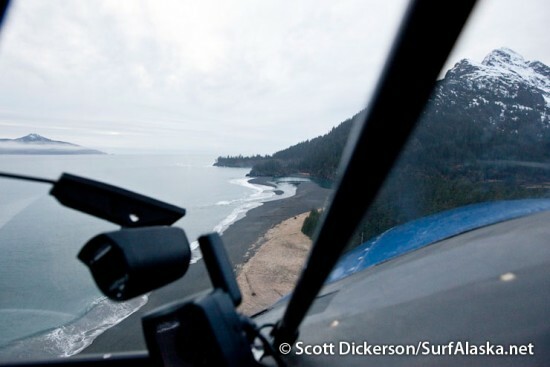 Petrof Glacier surf break aerial view. Three days ago we scrambled at first light after noting a building swell forecast for a couple days and hoping that the mountains would not be shrouded in clouds as they are 98% of the time in this season. We awoke to a hopeful sky. 45 minutes after the phones started ringing four of us were at the Homer Air office loading a Cessna 206 with our surfboards and survival gear. With some smart packing by the pilot we can easily fit four surfers, one surfboard each (less than 8ft) and some camping gear and food for the day. The camping gear is for the almost expected change in weather that would prevent the airplane returning for a pickup. So far we have never actually been ‘stranded’ though on a few particularly sweet occasions we found ourselves wishing it would happen. 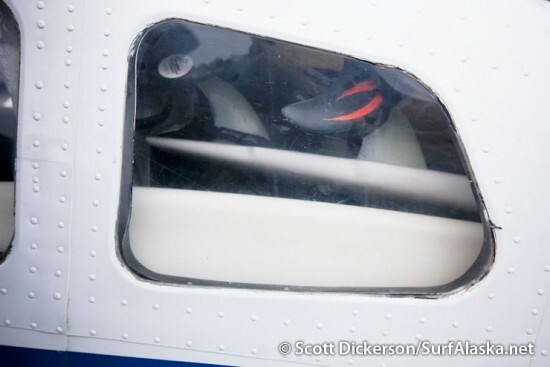 Back seat window of the airplane full of surfboards. Once over the mountains the suspense builds as we start getting glimpses of the ocean on the other side. Things were looking good this morning – the rocky reefs had white rings around them from an ocean surge. One pass over the surf break and we knew it was our lucky day. After one aborted landing near the break where we discovered some exciting bumps on the beach, we had a silky smooth touchdown about a mile back up the beach. With the winter darkness only allowing us four hours on the ground (or in the water) this time of year, it was a frantic show getting the plane unloaded, into our wetsuits and off running down the beach to the surf break. 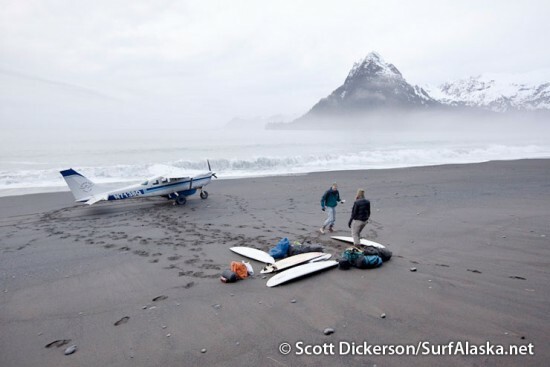 Mike McCune and Iceman unloading their surfboards from the plane on Petrof Glacier beach. 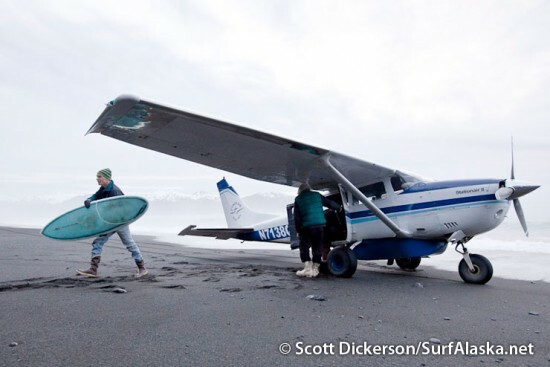 The plane preparing to depart leaving Mike McCune and Stephanie Haynes in their own Alaska surf paradise. 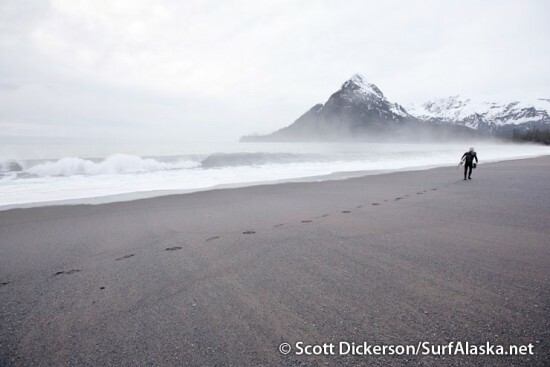 Iceman leaving the only set of tracks on the beach as he walks towards the break. Mike walking to the Petrof Glacier surf break. We were pleasantly surprised to see that the winter storms had changed the layout of the break significantly for the better. The tidal slough drain / river shown in the above photo has moved it’s outlet down the beach a couple hundred yards which keeps us from having to fight the current during the ebbing tide. And in its wake it left a picture perfect sand bar that looks like it was hand carved for producing peeling rights. When I edited the photos there was too many to fit in one nice post, and really, getting to this surf break at Petrof Glacier is half the adventure so I’ve split it up into two posts. The rest coming soon, your patience will be rewarded. Man, when I get back to AK in two weeks I need to hook up on one of these trips..Priceless!!! Wow, way to break in the New Year! Looks like fun, can’t wait to see more. Ecuador was a blast and the waves were fun but nothing ever built while we were there. Hope to see you soon Scott, keep the pictures coming! Super F ‘n stoked Scott! Well done!! WOW!! I really like this adventure guys.. 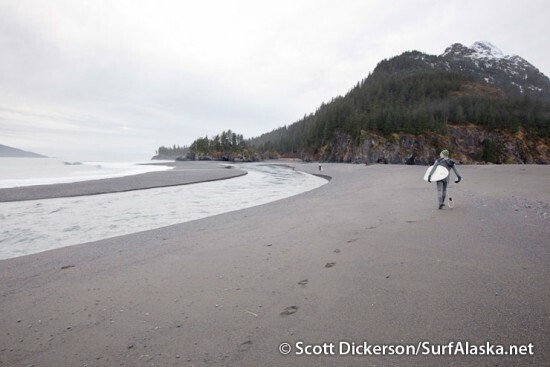 I thought oregonians did alot to surf cold water! this is the ultimate surf adventure and Im stoked for you guys! is this spot always this clean? is this a huge swell that has to wrap a long way in or something? We like this one too. It’s been a good spot for us so far. I don’t think we’ve ever had it messy, just smaller than we’d like a couple times. It seems that it takes about a 6ft+ ocean swell to make it worth the trip. On a 9ft ocean swell we can anticipate head high waves. Tide is a big factor and the way the bar is shaped right now we like the higher end of the tide best. Unfortunately that’s when the plane can’t land on the beach so we have to work around the tides and short daylight and of course flying weather . . .
estimados amogos los felicito por surfear en alaska en unas aguas tan heladas, verdaderamente es incrible lo que ustedes hacen, yo surfeo en aguas donde la temperatura es de minima 22 grados centigrados y maximo 28 grados centigrados a surfear en aguas bajo cero o punto de congelarse es increible. Hey, you know what guys – your posts are truly the best. The photos are breath-taking. Very nice blog. I’ll keep coming back for more posts. Thanks for sharing!